It’s entirely possible* I’ve been watching too much Doctor Who, but as I picked honeysuckle this morning I wondered whether a plant growing in a particular place becomes imbued with the spirit and motivations of the people who spend time there. It’s a sly sideways view of terroir, the ancient notion that says what’s produced in a certain area is the result of a confluence of factors that include sun, rain, soil, and more. The product, whatever it is, absorbs the qualities inherent in that particular environment. This gives it a singular flavor, one that cannot be duplicated elsewhere. Many, many examples support this. There are San Marzano tomatoes, first developed in Italy. 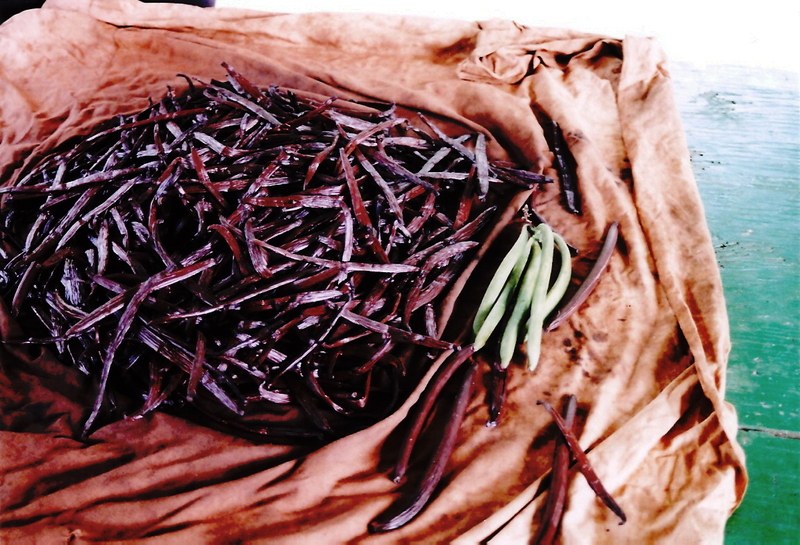 They’re prized among chefs, who attribute their intense richness to the volcanic soil in which they were grown. Connossieurs in India scoff at American-grown basmati rice (‘Texmati’), saying fragrant, long-grained basmati rice is not the same if grown outside India. Grass-fed New Zealand lamb has unsurpassed flavor and texture. I could go on. If this is true, if tomatoes and rice and lamb can carry within them tangible components from their environments, how far-fetched is it to imagine they can carry intangible ones as well? My favorite small farm is a half hour south of me. The food they grow is lovely. But I drive out there just as much for the serenity that wraps around me with the wind in those fields, for the peace that’s cultivated along with the English garden peas. I go because I know the integrity of the farmer and his family and staff. That integrity means their produce is more than an itemized scale of nutrients. It’s food plus a great deal of heart. And yeah, it tastes like it. At least to me. A hot water and sugar treatment. It’s like Elizabeth Arden for flowers. Another example. Native nations in the U.S. often wore animal skins, bone, and feathers—not to be decorative, but because they believed in doing so they would take on characteristics of those animals. And who couldn’t use extraordinary strength (buffalo), regenerative powers (bear), and shrewdness (coyote)? Let’s take it one step farther and throw people into the mix. I know I am the product of my many manufacturers. They include the food I ate, the sea-and-lake misty air I breathed, and the trees I played under as a kid. But they are also my parents, my teachers, my friends, the good and bad words, the wisdom and the idiocy. They all formed me as much as the pasta I ate. All were my terroir, and I’d wager so were yours. Back to honeysuckle. 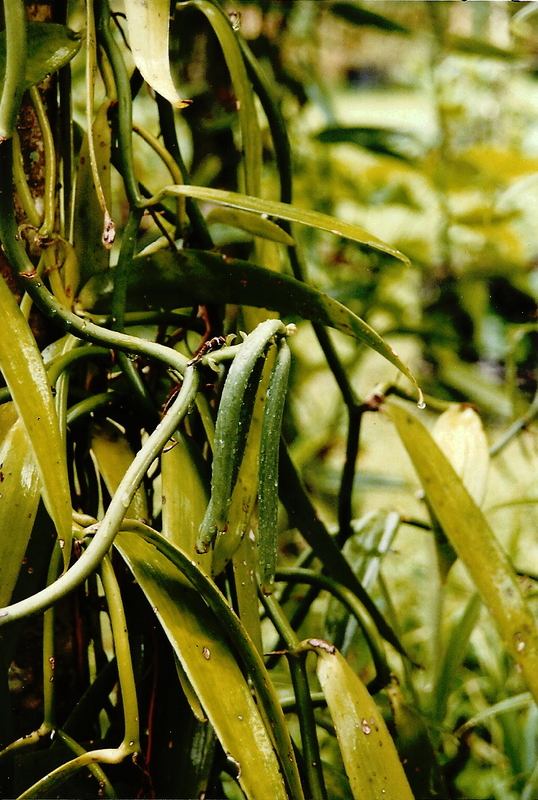 It’s an invasive and grows almost everywhere there’s dirt and something to climb. But I still shopped around before I found my favorite place to pick the flowers. Didn’t want to pick too close to a parking lot, junkyard, high-traffic road, or residential yard. That’s about exhaust fume and pesticide pollution. But I’d equally dismiss flowers grown on perfect, organic public lands close to a contentious family, or near the home of someone who routinely chooses nastiness over kindness. It’s one of the benefits of living in a small town; information like this is easy to come by. Tell me this isn’t the ideal spot: a fence maybe 12′ by 30′, and in between, a solid, opaque wall of flowers. If this honeysuckle hedge had eyes it would have within its view our little baseball field, train station, playground, and lake. Hundred-year-old trees shade it east and west, twice a day, and the rest of the time it’s blessed with full sun. All day long the flowers witness, and pick up the good vibes of, pick-up baseball games, kids on swings, canoers, dog-walkers, and families meeting tired commuters, the latter of whom always take a big breath when they step off the train. It’s not all ice cream there, of course. Kids will get mad at other kids and yell, ‘No fair!’ Commuters have to go to work, as well as come home from it. There’s bad with the good. But that’s as it should be; and anyway, the good far outweighs. Even the honeysuckle flowers come in two different colors (orange and yellow), have two different flavors, and grow in pairs. A little of this and a little of that. Both are required for a well-rounded syrup. It could all be in my head, this entire-environs theory of mine. But I don’t think so. On the below, which I dreamed up kind of out of nowhere: I liked the idea of pairing honeysuckle with almond, as they both share floral flavors. The chocolate garnish was inevitable. 1) I made the syrup.**. 2) Next came the custard. I used Martha’s vanilla pudding recipe. I left out the vanilla, and instead, once cool, I stirred in about 2/3 cup of syrup. 3) For the tart shells, I also used Martha’s pate brisee recipe, and substituted 1.5 cups of almond flour for part of the all-purpose flour called for. Baked it in cute little tart pans. 4) Then I piled up the custard into the shells, shaved some really good-quality bittersweet chocolate (Noi Sirius Pure Icelandic Chocolate, from Whole Foods) into the middles, toasted a few sliced almonds, and added those to the top, too. Made a heckuva good teatime treat today, along with the extra custard I ate out of the bowl with a rubber spatula. 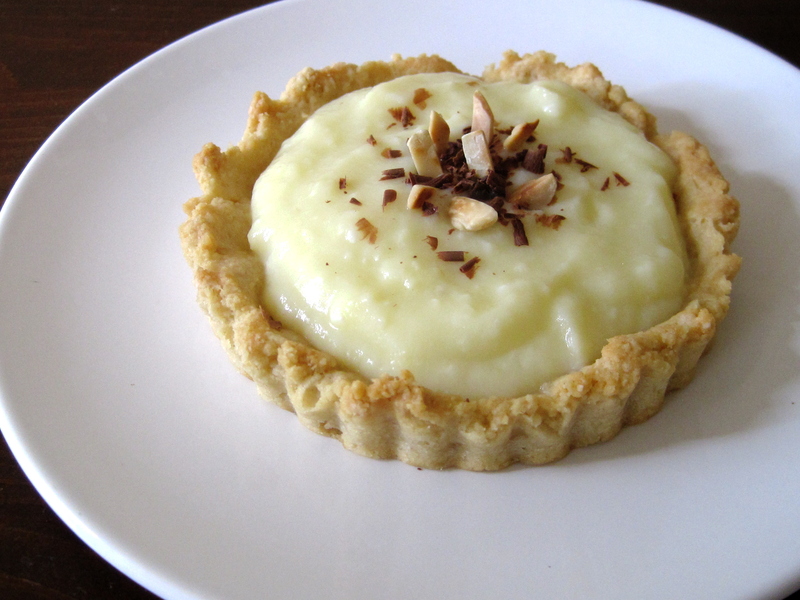 Honeysuckle Custard Tarts with Salted Almond Shells, Shaved Chocolate, and Toasted Almonds. Righteous ensemble. *Let’s call it likely and move on. **For more on the embarrassingly simple process, see last year’s post. So I have this reader who might be the most enthusiastic guy ever, owing at least partially to the fact that his company makes really good hot sauce for a living. I’m sure this factors in. It would for me. Johnnie Walker’s company is Two Mile Creek (twomilecreekspecialtyfoods.com), out of Colorado. They crank out some of the more creative jellies and jams that I’ve tasted, and moreover don’t have anything weird in them. When I wrote about a gluten-free sourdough recently and thought to smush TMC’s habanero jelly and fresh goat cheese between it, I posted a pretty pic. I ate this sandwich last winter on a day when my heat was flaking out, and it warmed me from the toes up. The below recipe was gifted to me by Johnnie for my cooking project this year. It features the habanero jelly (properly called ‘Habanero Hot Pepper Jelly made with whiskey-infused apricots’, like you needed any extra incentive to try it), and makes a very simple and satisfying weeknight dinner. -Used plain yogurt instead of whipping cream (Have to watch my cholesterol. Boo and bummer, but it was great just the same). -Used some of the tomato sauce I made from last summer’s crop. -Left out the wine and served it straight up with no pasta/rice/polenta, but I am sure it would be lovely to add any or all. -Added twice the amount of hot jelly 😉 Wildly yummy. Pat the chicken dry with a paper towel and season with the salt and pepper. Heat one tbsp of the oil in a heavy-bottomed skillet over medium high heat. Cook the chicken until golden brown, about 2-3 minutes per side. Transfer to a plate. Heat the remaining oil in the pan and when it shimmers, add in the onion. Cook until the onion is soft and clear. Add the jelly and the garlic and oregano. Cook until the aromatics are in the air and in your nose, about 1 minute. Stir in the tomatoes and the cream. Add three dashes of salt and bring to a boil. Return the chicken to the skillet and add any juices that have accumulated. Simmer this covered until chicken is firm to the touch and cooked through, about 10 minutes. Transfer chicken to a plate and cover with foil. Simmer the sauce, uncovered, until it thickens, about 5 minutes. Add the basil or the Italian seasoning and the white wine. Simmer for 2-3 more minutes. Season with more salt if needed. Pour the sauce over the chicken and serve over the carb of your choice. I’ve never been to England**, which I hope to remedy sooner rather than later, but in the meantime I was excited to try Jenny Davies’s (of Jenny Eatwell’s Rhubarb & Ginger blog; URL below) recipe for a curry as part of my cooking project. Curries are a favorite English takeaway meal. Here in the States—in central New Jersey, anyway—curry isn’t a common thing for takeout (our own expression). I can count my experiences with curry on one hand, delicious though they were, even the one at Whole Foods’s food court. The nearest Indian restaurant is about a half hour away. This is a great sadness in my heart. The below helps to remedy that. I edited lightly, and parenthetical additions following dashes are mine. It looks like a lot, but Jenny simply broke down each step for us. I listened like a good girl and spread out the process as she suggested, though—a wise idea. Loved seeing the basmati rice get longer instead of fatter like ordinary rice! Should have used a red chile, but Trader Joe’s didn’t have one, so I used a nebbishy jalapeno. Had to add red pepper flakes to the final product to make it spicy enough for me. I didn’t know what a donkey carrot was; Googled it, even asked a friend who works with Brits to make inquiries, both to no avail. And not having a donkey lying around, I couldn’t ask one to clarify. So I just used two big carrots. Didn’t use a tomato because this time of year in the northern hemisphere, they taste like a squishy wet nothing. 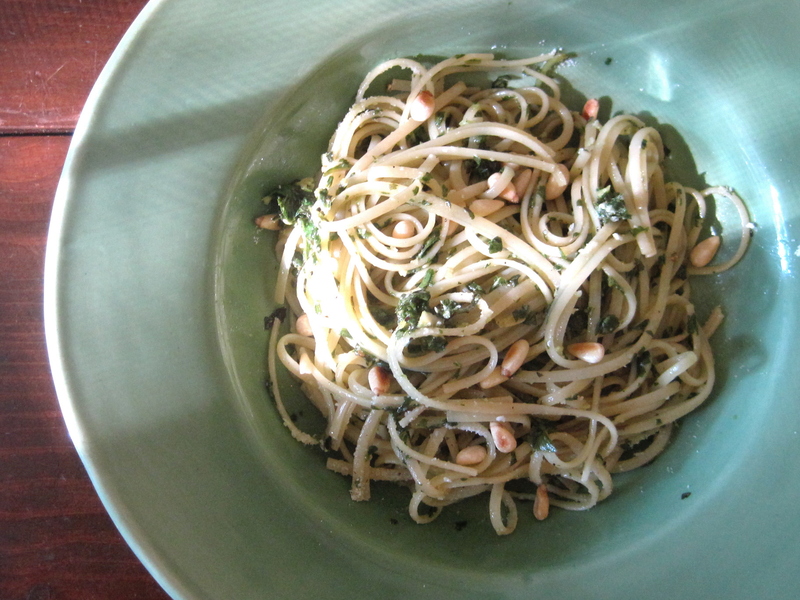 The result was a warm, flavorful, comforting dish that makes you feel as though you are taking very, very good care of yourself for once…and you are. Half a cup of peas—(defrosted, or freshly shelled). 1. In the morning, mix together the yoghurt, chutney and curry paste in a large bowl. 2. Trim the chicken breasts of fat and gristle, then score lightly across the top to allow the above marinade to more easily penetrate the meat. 5. Add the onion – and a small pinch of salt – and cook for around 10-15 minutes until golden brown, but not burned. Add the garlic and stir quickly, then add the chilli and stir. 6. Next, add the carrot pieces, which will help to cool the pan and so avoid burning the garlic. 7. Next add the curry paste and tomato puree and stir well to combine with the rest of the ingredients. 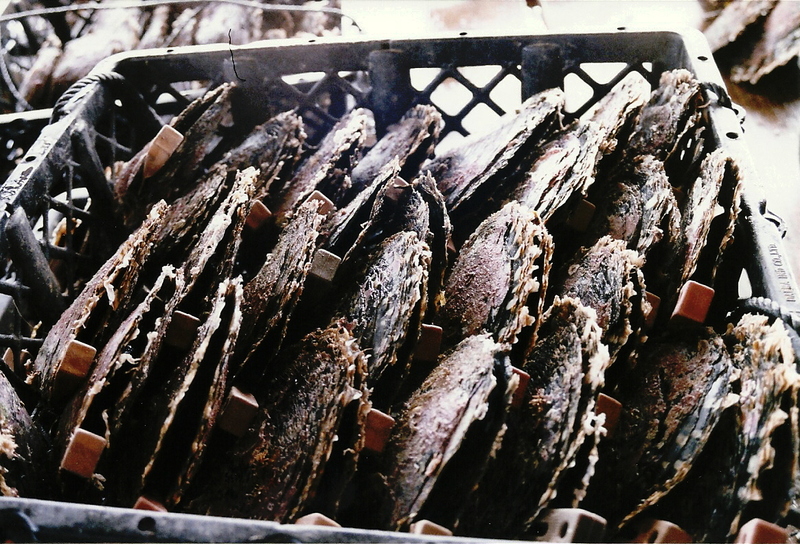 Cooked until the oil is released – just a few minutes. 8. Add the potato/mushroom/red peppers and stir well to ensure they are coated with the curry mixture. 10. Stir in the red lentils and let everything simmer gently together for around 20-30 minutes until almost cooked. 12. Several hours later and when you’re ready to prepare the dinner proper, begin by turning on the heat under the vegetable curry and pre-heating the oven to 200degC/400degF/Gas 6. Line a shallow baking tray with silver foil (optional – but it helps with the washing up!) and place the chicken onto the foil. 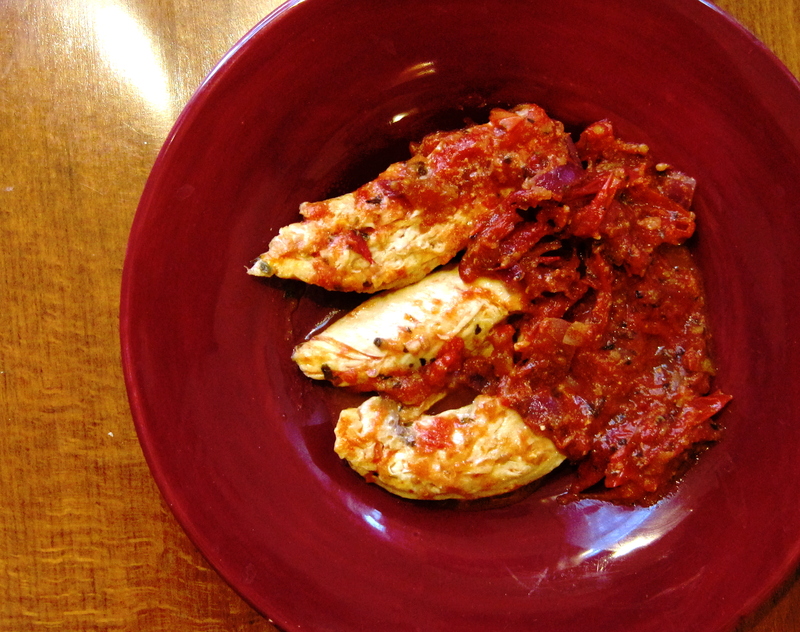 Spoon any additional marinade over the top of each chicken breast. Place into the oven for 25-35 minutes or until the juices run clear if pricked with a knife. 14. Put the dry rice into a sieve and run it under a hot tap until the water runs clear. Once the water in the pan boils, add the rice and cook – simmering – for 7-9 minutes. 2 minutes before the rice is due to be ready, add the defrosted peas. 15. As the rice is cooking, the vegetable curry should have come up to temperature. Remove the lid and allow the sauce to reduce a little as you add the broccoli, tomato and three quarters of the fresh coriander. Stir from time to time, to make sure it doesn’t stick to the bottom of the pan. 16. Once the rice is ready, drain and return to the warm pan. You can add a little of the chopped coriander for some extra flavour, if you like. 17. Once the chicken is done, serve with the vegetable curry and green pea rice – with an added flourish of a sprinkle of chopped coriander for garnish. *I’ve argued this point before, the one about eating what the locals eat. * It fails not. **I have been to Scotland, which soaked into me like butter on a hot scone; and flying home passed over Ireland which, even from the sky, is an ethereal green. Someday I will get there. Wales, too, and not just to see Cardiff, though that’s an obvious draw. Gonna be even purtier when they’re tipsy. The first thing I want to say is WOW, and the second thing I want to say is grazie. You sent recipes from as close by as across the lake and as far away as South Africa. I selected 25 of them. Stoked doesn’t come close! I chose the recipes for this project after having exhaustively researched the origins and ingredients for each, creating a map across my studio wall with pins stuck in various countries, burning up Google, and whipping up a spreadsheet outlining…okay, no, that never happened, it’s more like I was just mouth-open intrigued by every one. That’s pretty much all of the rhyme and reason involved here. Some recipes are ones I’ve never tried before and have always wanted to, some are ones I’ve never heard of, and some are classics. And I’ve never made any before, which was a major selling point. Some of you sent more than one recipe. That’s cool. I’m a game kind of girl. As I make each recipe I’ll be documenting the whys, wherefores, and holy-craps here. Along those lines, come on and cook one recipe or all with me. When you do, write in and tell me how it went. I think one of the best ways to get under the skin of a country and its people is to taste its native cuisine. Food and the stories that accompany it can be transporting. They can carry us to another time and place as well as or even better than an airplane can—or in some cases, a time machine. * Your kitchen is your cockpit. This will be an education for all of us. I’m still waiting on an official go from some of you, and some I’m not sure I can swing,** but here are my choices. *It’s true, but it’s also a gratuitous Doctor Who reference. So you know. 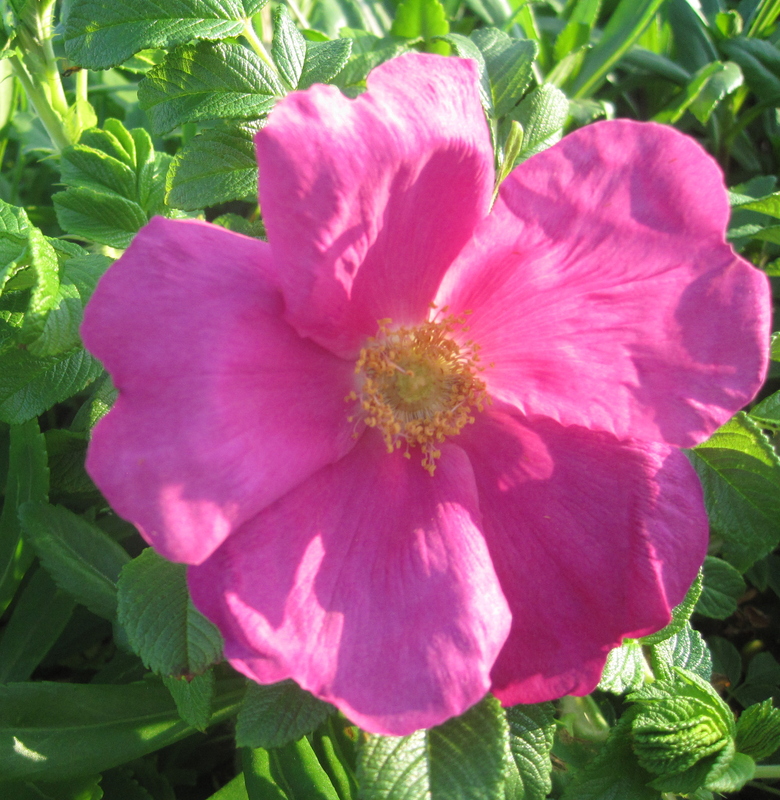 **Whether I will make the rose liqueur, for example, depends on whether I can find a sweet-tasting, unsprayed bush. And it has to be on public property, because making the recipe after having avoided a felony charge will only make it that much more enjoyable. 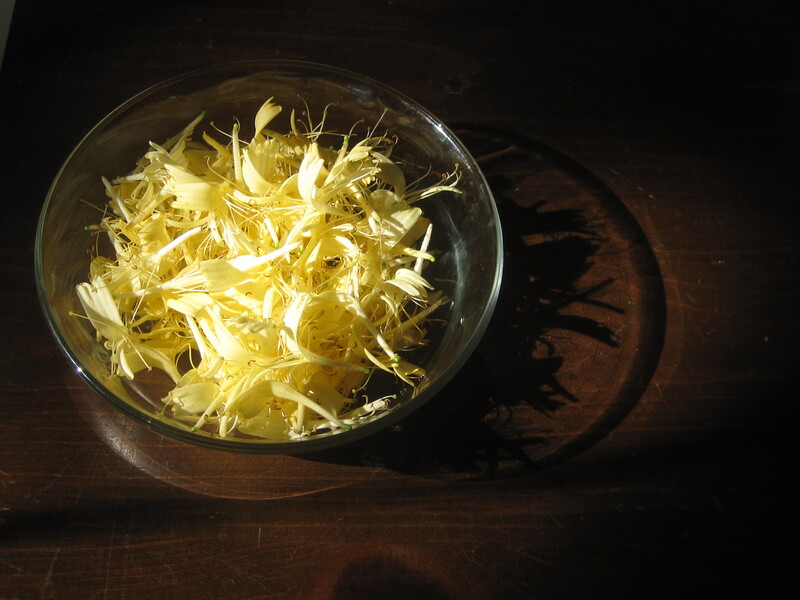 I’ve tasted petals from about six different wild bushes that range from neutral tasting to bitter. Cross them fingers for me. To put an even finer point on the no-shoe thing, the guy who picked us up from the airport and took us to Sunset Beach Motel sported a sun-bleached ponytail, equally sun-bleached tank and board shorts and chic French accent, but he wore no shoes the entire time we stayed. That includes driving and walking us into the local grocery store. I think it’s safe to assume that right now, this exact minute, he’s barefoot. On these islands you’re in flip flops, worn until the soles are translucent, or you’re barefoot. It’s awesome. 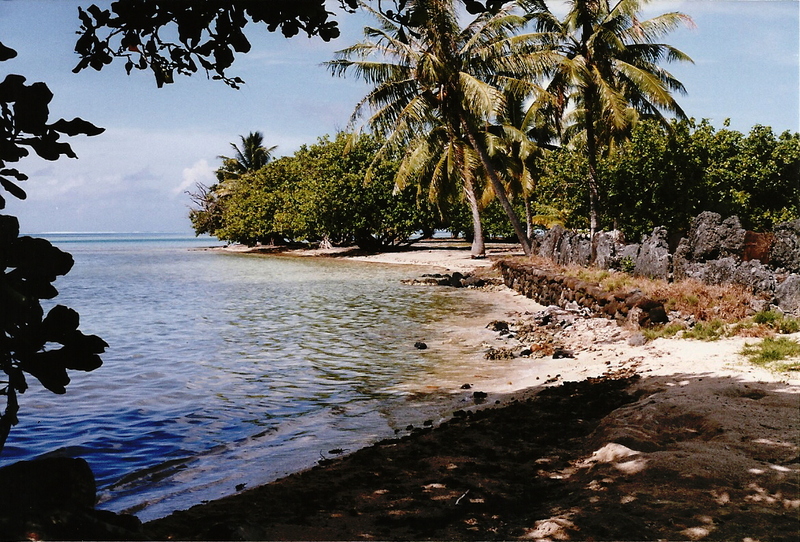 The above is offered to give you an idea of just how remote Raiatea is, and let me know if it did the job. Next to Mo’orea—which is pretty far-flung, I’ll grant; the locals cook their dinner in the ground as often as in the oven—Raiatea feels like the tropical outback. Yes, there’s a bit of civilization, but I felt more isolated on this island than anywhere I’ve ever been. It was a usually exhilarating, oftentimes uneasy feeling of being quite literally Nowhere. I love the feeling of being detached from what I know well; I love seeing vegetation and landscapes unlike anything I’ve seen before. Here I felt pushed to the teetering edge, to the razor-thin sliver, of that feeling. Which is good for a girl now and again. Back to the food in the grocery store, because you knew I wasn’t going to let that slide. I love food shopping in foreign places. Here (as well as in Scotland and on the Caribbean islands I’ve visited) eggs are left out on the counter. Produce is exotic and spiny. And the vanilla yogurt wasn’t like any vanilla yogurt I have tasted, and believe you me, I live on Stonyfield. The stuff doesn’t even taste like vanilla, to tell you the truth. It’s not mellow and sweet; it’s tangy, sharp and floral. We ate cups of this every morning for breakfast and liked it more every day. 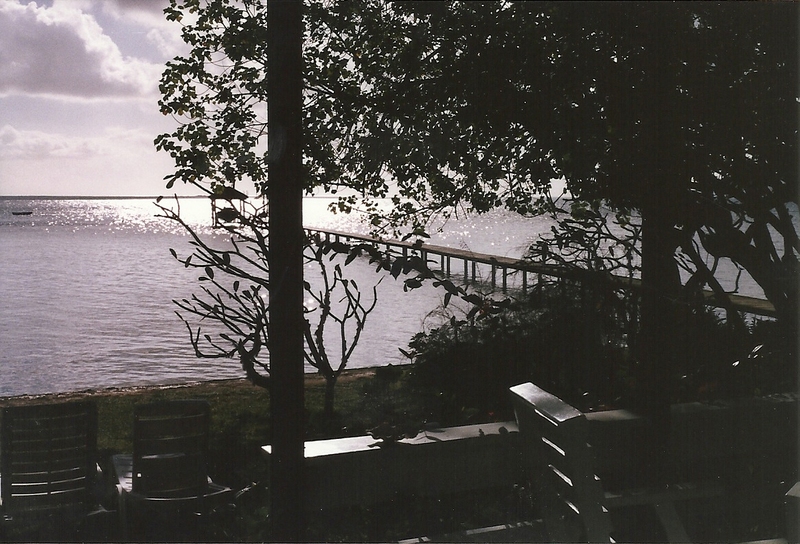 That was our cottage below; our living room strewn with freshly picked hibiscus (the bedroom and bathroom were, too); and the view of the ocean from our porch. The dock was ours alone to use. 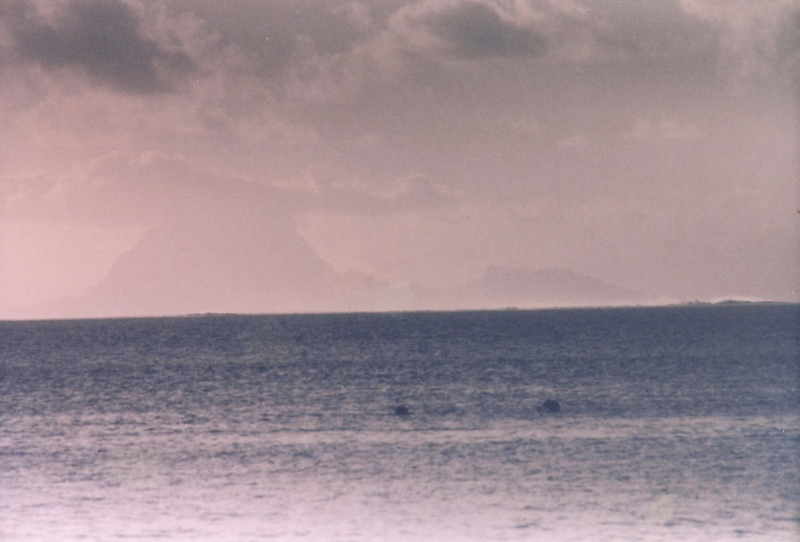 The tiny island of Taha’a was visible on the horizon, as was Bora Bora. Snorkelling was terrific off the dock. 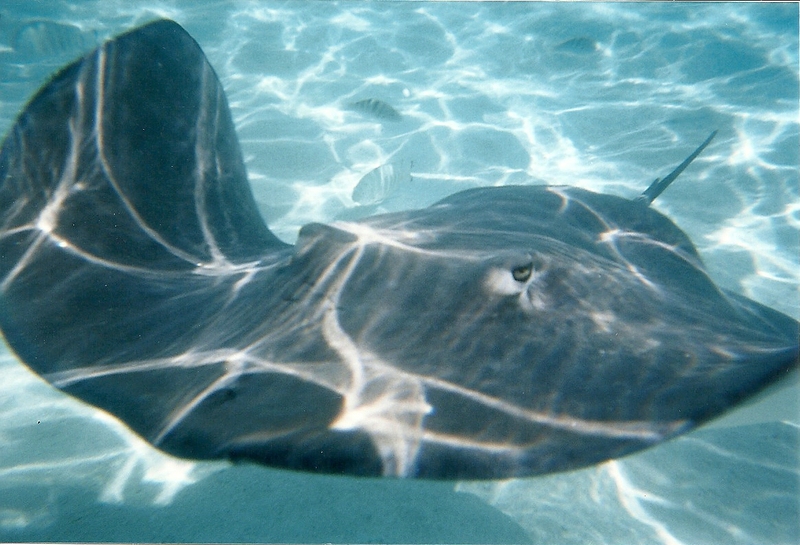 Floating with fins and a mask, arms at my side, it was very easy to feel like one of the fish—a dreamy and exquisitely peaceful feeling. At night we lay on our backs and looked up at the stars. In so very remote a place, with so little electricity being used, they looked like rock salt thrown across black velvet. 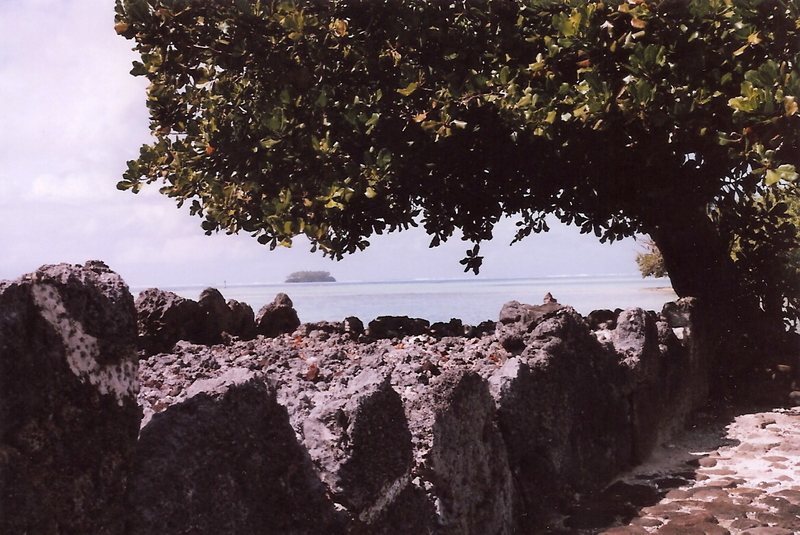 Raiatea is called ‘the sacred island’ because it features so many maraes (ma-REYES), ancient areas of worship marked with stones, much like Stonehenge and similar edifices throughout the UK. They’re humble and at the same time magnificent. In the US, if former President McKinley once hiccuped near a building, we put up a sign commemorating that heartfelt event. But something nice about this area of the world: You more or less happen upon places. Or you ask a local and they’ll point in a direction. And there are very few signs saying what’s what. Stuff is what it is, and that sort of lends dignity. Here are two maraes on the water. 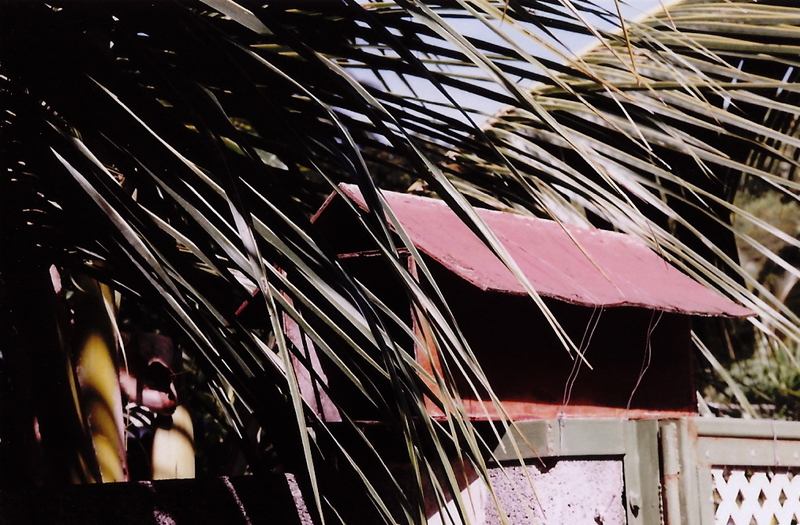 The girl took us along with three grinning young Frenchmen by speedboat out to the black pearl ‘farm’, the small, enclosed wooden hut on stilts a half mile or so out into the Pacific. 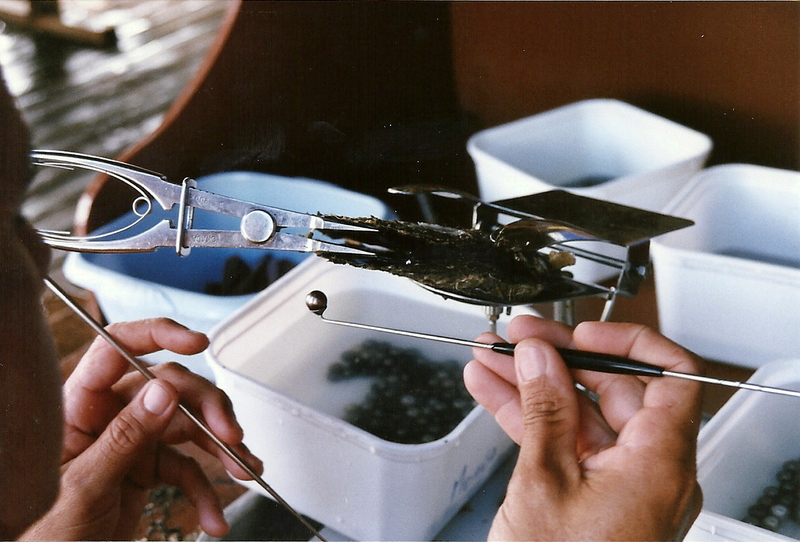 There she and her family do the delicate, labor-intensive work of cultivating black pearls. 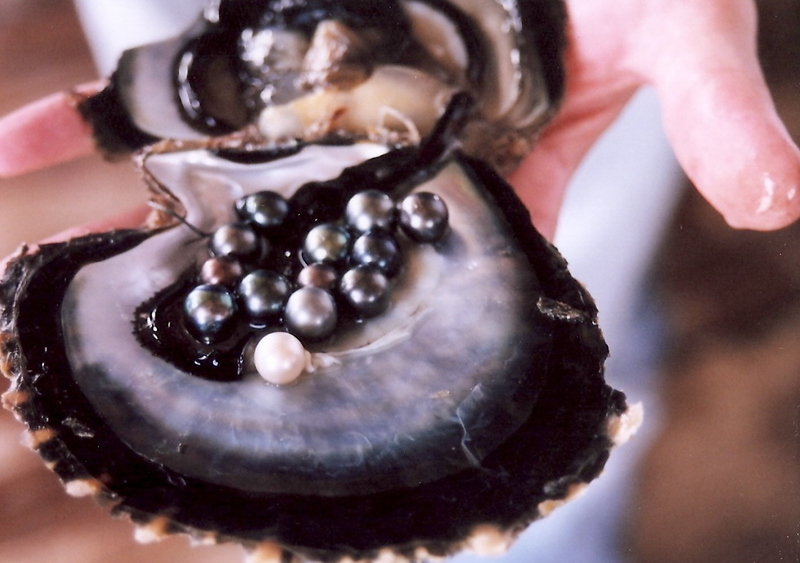 A pearl nuclei (they get them from Mississippi) will be placed into each of the oysters below, which are about the size of a bagel and quite flat and scaly. Then they’ll be put back into the water for something like three years. 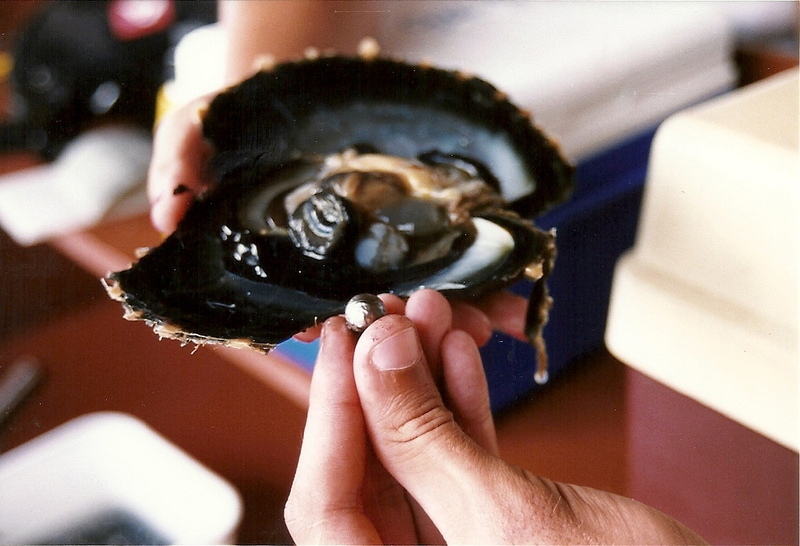 Here is a pearl, still rough, being extracted from its host oyster. The shade a pearl becomes depends on the unique colors of its host. Below is an example of the variety of colors available, along with a white pearl nuclei, held by one of the grinning young Frenchmen. He spoke a little English and I spoke a little French. It was cool. One night for dinner we went to a local pizza restaurant called Le Napoli. The wood burning stove was smoky and the place was enclosed, but it was loud and fun, and the Quatre Saisons, Four Seasons, pizza was yummy. It was divided into quarters and each had a different topping. Une famille with two cute little kids sat at the counter, and the cook gave them each a little piece of dough and plastic rollers, and they goofed with them and had a good time. For dessert we shared a scoop of local vanilla ice cream—we ate vanilla shamelessly and in every conceivable guise throughout this trip—and a scoop of taro, brownish/purplish, musky sweet. We took another trip into town to get a highly recommended coconut milk at a highly recommended place, but the store hours we were given were wrong, plus the place didn’t sell it anyway, so curse you, Frommer’s Guide. Returned our car to the Avis dealership, where the proprietor’s daughter was sitting on the sofa with her bottle watching Dora the Explorer in French, which still sort of freaks me a little. 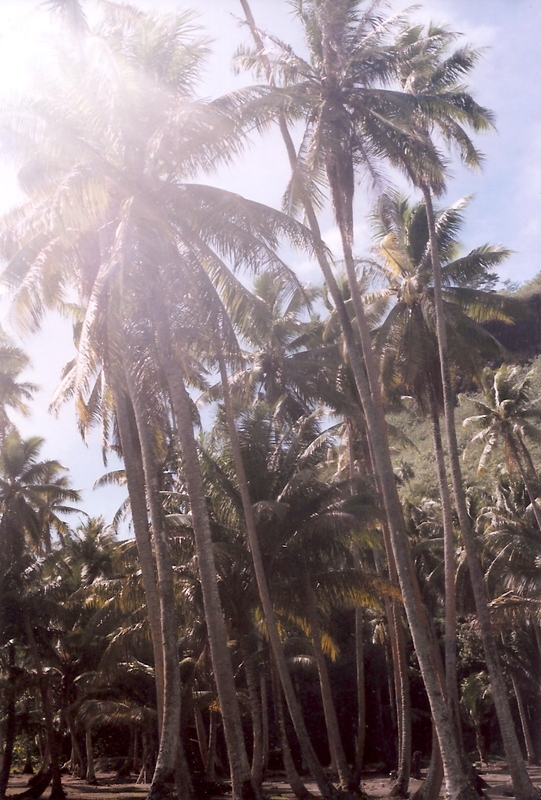 I’d read that there were places in the South Seas in which the very air smelled like vanilla. So entranced were we with this notion that we had to find out. And okay, Taha’a was not one of those places, but despite its very small population and drizzly weather, that island was such an adventure that it didn’t matter what it smelled like. We met the tour group on a dock; the director, Edwin, was a cross between Don Juan and Buddy Hackett, if both of them spoke French. He assured us that once we got to Taha’a his son would take over in English for those of us who hadn’t spoken a word of French since college. (Cough.) In the meantime, I translated what he said to Michael, which was not missed by Edwin, who got quite the bang out of it. Next was the trek to lunch through the interior of the island. Driving along the bumps in the road (and please apply that term in the loosest possible way—imagine strapping old car batteries, Progresso soup cans, and empty 1-gallon plastic bottles of Tide to your car tires, and now drive) took about an hour. But it was a veritable jungle, Rudyard Kipling on his best day, with dense palms, fruit bearing trees, and tiny, vibrantly colored wild orchids wound around tree trunks. Again, it was breathtaking to be in an entirely new environment, even if it required shaking loose a few molar fillings to enjoy it. 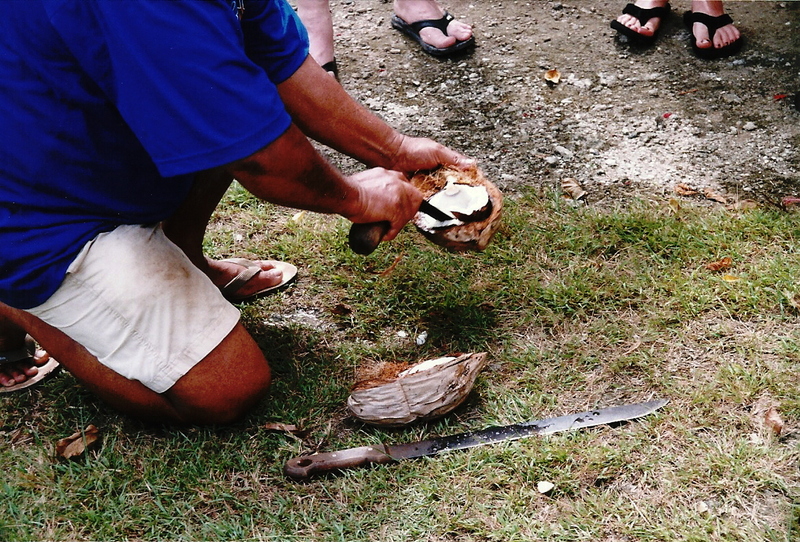 Edwin stopped now and then to cut down ripe papayas and other fruits with his groovy knife (see him and groovy knife below with a coconut). Lunch was at his house, and his wife prepared it all: poisson cru (very popular Tahitian dish; it’s like tuna ceviche, made with coconut milk and lime juice), mahi mahi with a vanilla cream sauce (I loved how locals used vanilla in savory dishes as well as sweet ones), coconut bread, sashimi, fish balls and rice. The fruit Edwin had collected was our dessert. Papaya, pineapple, banana and guava, chopped up into fruit salad and all so meltingly ripe that it was half fruit and half juice. Never saw the inside of a refrigerator, either; and without the distraction of being cold we could taste the nuances of every sweet, floral, succulent, crazy-beyond-organic fruit. He joked that it was Del Monte. They wish. 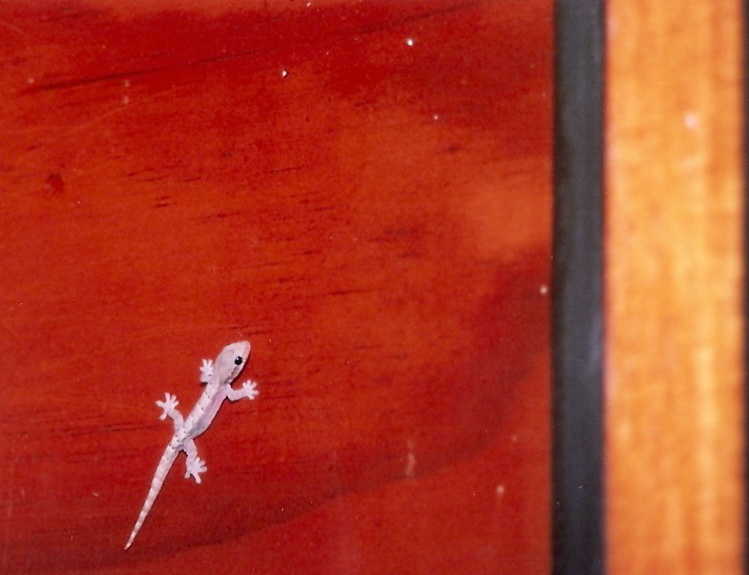 French Polynesia, and especially Raiatea, has one more charm, and that’s its gecko population. These little dudes are everywhere, including in your hotel room, including including in your bathroom, making me think twice about leaving the light off to sit on the toilet in the middle of the night (and once there WAS one on the toilet seat, and I shooed him away because he was way too tiny and cute to die in such a horrifying way). Geckos can be anywhere from an inch to maybe a foot long. When they crawl they sashay their little hips from side to side. 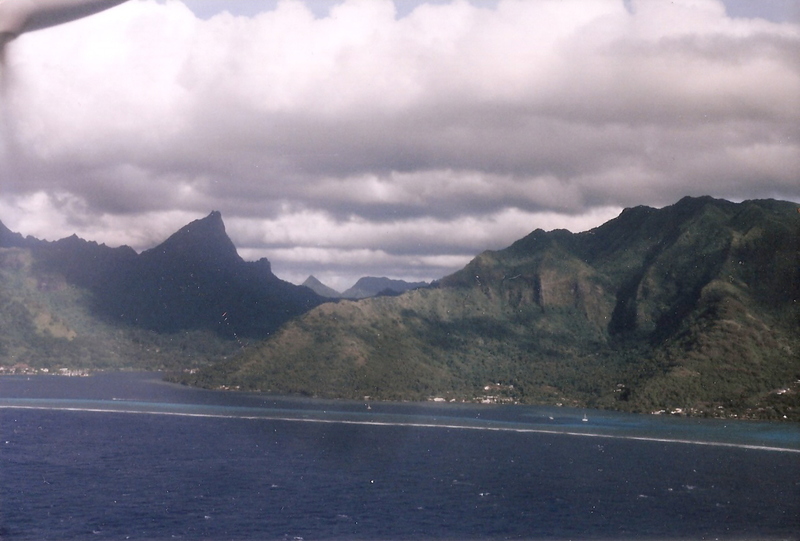 We kept our carry-ons tightly zippered the whole time we were on Raiatea just in case any had delusions of adventure. *Kind of sounds like a gas. Not that our overburdened health system could handle it. **It’s amazing how much trust we gave the people on this trip. I’m not kidding. First the sharks and then this. We’d seen the Indiana Jones trilogy countless times, plus are from the NY metropolitan tri-state area, and freely admit, ‘AAAAAH he says he’s from the restaurant but it’s really his shifty brother-in-law and he’s going to spear us or whatever they kill you with out here and leave us to be eaten by pythons and feral cats’ was the first thing that went through our minds. But if you think about it, what do we know about stateside taxi drivers, or car service guys? We jump in their cars without thinking. We trust them. Why, in God’s name? Do you ever wonder? ***The island kept surprising me. When we rented a car (a citron-colored Citroen, in the land of citron, no less! ), the woman who dropped it off to us was brought back to the Avis office in a Rolls-Royce. ****Another fine example to illustrate the parenthetical statement, above. January’s been typecast as cold, gloomy and bleak as a dungeon. Well, it earns every adjective. Time for an imagination vacation. 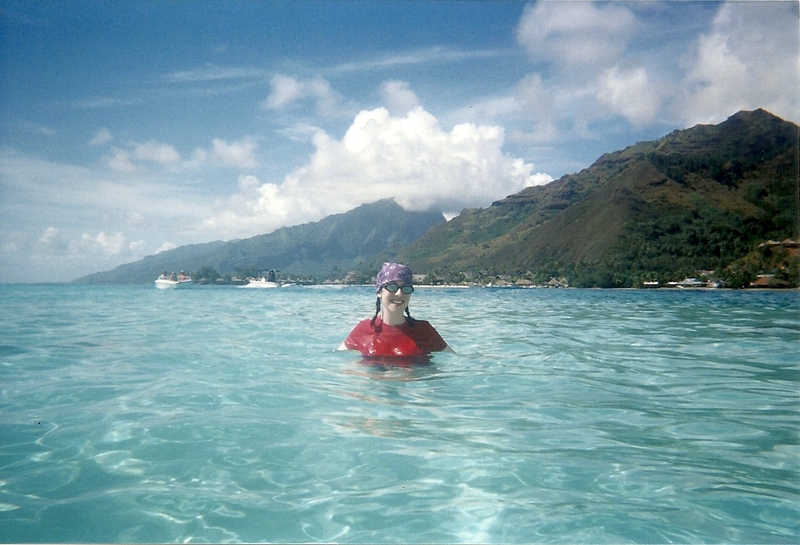 In 2008, after several years of being almost totally debilitated from stress, images of Bora Bora kept popping into my head. To put an even finer point on it, I was dreaming of the color I imagined the water to be—turquoise blue, impossibly beautiful. This color became a nearly all-encompassing obsession; I didn’t just need to see it, I needed to rub it into my skin like lotion, I needed to let its essence sink into and saturate my very bones. Lucky for me, at the time I was married to Michael, a guy who was game for anything. We figured we were exhausted already—me from being sick and him from taking care of me—and in need a change of scenery, so why not travel halfway across the world? We packed two small rolling suitcases, a backpack full of food for the trip out, and a camera. Then we walked to the train station a couple of blocks away in our little beach town and ended up in an archipelago in the South Seas. 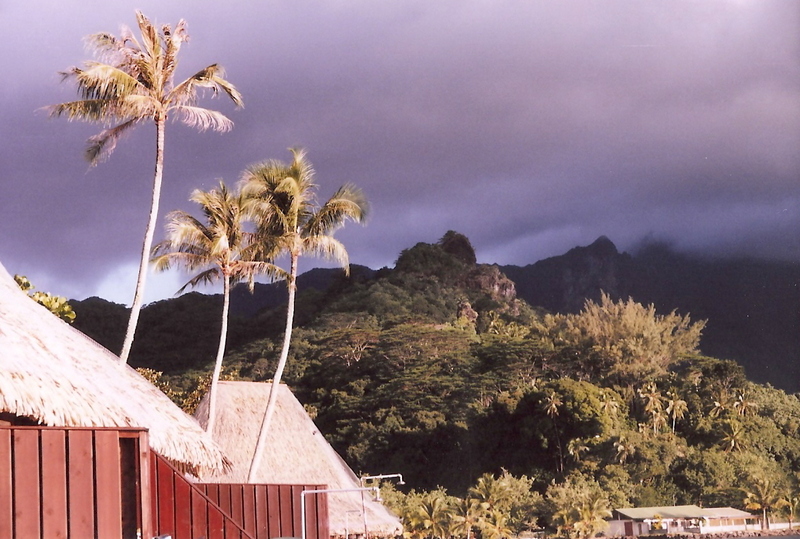 Six and change hours from Newark Airport to LAX, then nearly 8.5 hours to Papeete, in Tahiti. 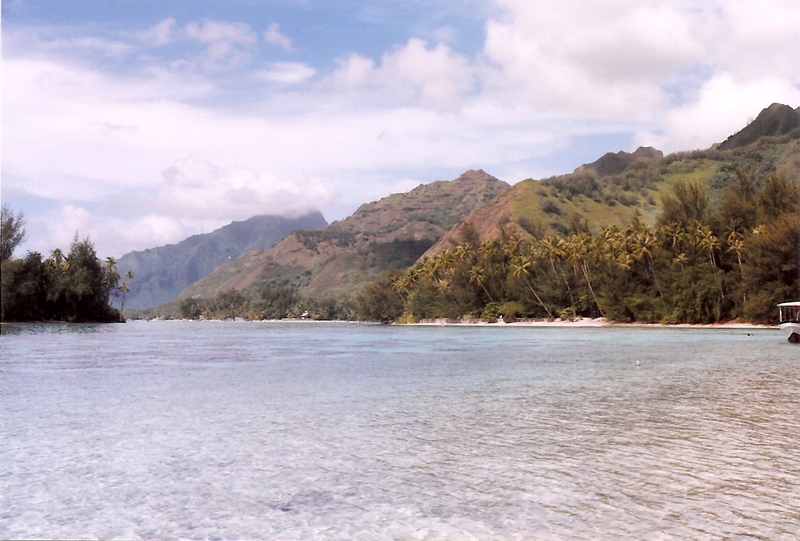 From there, we would puddle jump to Mo’orea, then to Raiatea and Taha’a, then end on Bora Bora. We decided to see the other islands when we learned they offered black pearl farms, vanilla plantations, jungles and astonishing beauty. If we were going to take the trip, we wanted to see it all. Two weeks, five islands, and nearly 48 hours of that time crossing a continent and the huge bucket of water called the Pacific. Why would anyone do this, especially in the shape I was in at the time? I can’t explain it better than this: I was desperately hungry for that blue. I still don’t really know why. I knew the whole idea sounded crazy. (Our arrival at the airport in Papeete did a lot to confirm this: We were greeted at 5a by two mildly hysterical guys playing tiny guitars.) But we did it anyway. 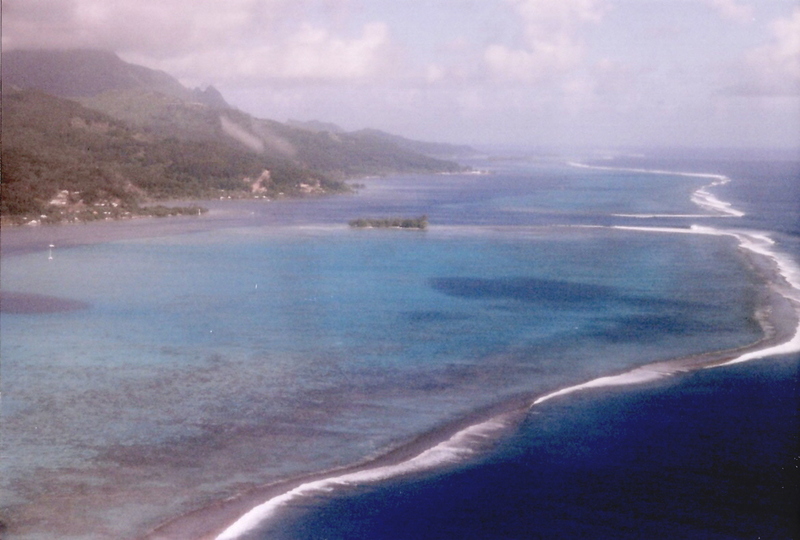 View from the window of the six-seat plane, a ten-minute flight from Tahiti. The thing about culture shock is sometimes it’s a good thing. 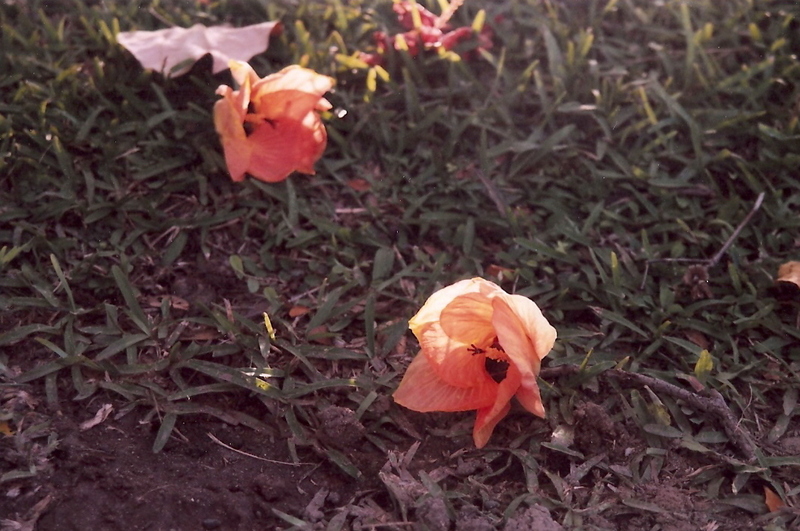 Both Tahitian men and women go about their daily lives with a little flower like the one below tucked behind one ear. No one thinks of it as a female thing. No one questions the men’s sexual orientation. It occurred to me on the first day in French Polynesia that any meaning people assign to flowers, or colors, or clothes, or anything else is subjective and arbitrary. And it also occurred to me that when offered the chance to cast off the assignations we happen to have been taught, it’s quite liberating. 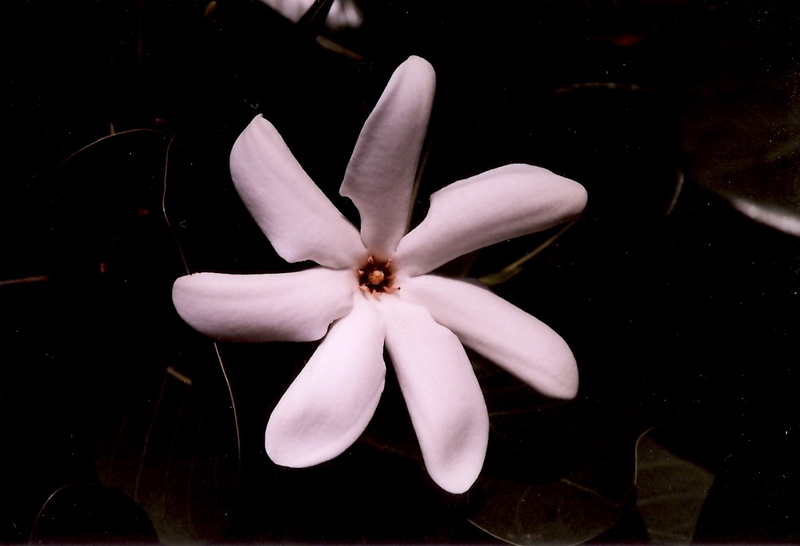 Tahitian gardenia–delicate, fragrant, and tasty, too. Stay tuned. The natives there move slowly, laugh heartily, and don’t seem to worry about anything. They also have a charming way of speaking. They don’t just say ‘Iaorana’ (ya-RAH-na, with a little roll on that r) as a hello or ‘Mauruuru’ (ma-RU-ru, same little r roll) as a thank-you. They singsong it: ‘Iao-RA-naaaaaaaaaaaaaaaaa…mau-RU-ruuuuuuuuuuuuuu.’ It takes a long time for them to finish talking but it’s a lot of fun to listen to. And it forces you to slow down. 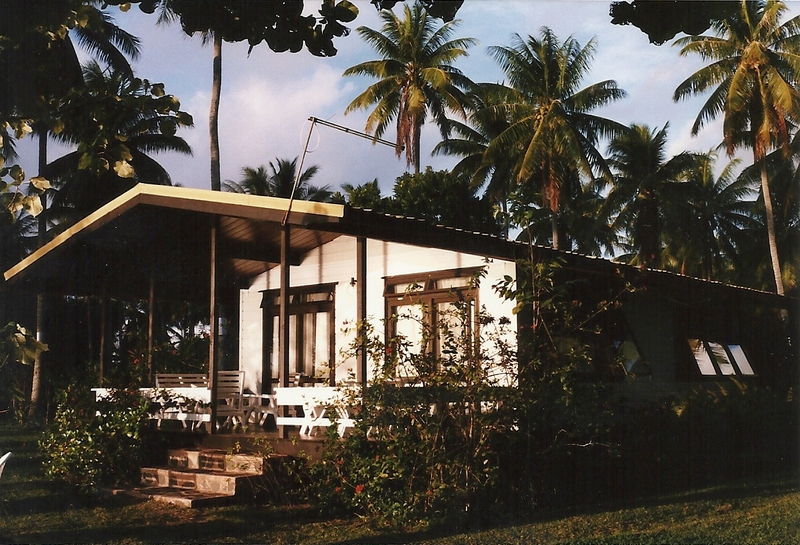 We stayed at Club Bali Ha’i, near Cook’s Bay. Our bungalow had the coolest 2×2 foot window in the floor so you could see fish swimming underneath. It even had a light so you could watch at night! But the camera didn’t get the full effect. Bummer. No TV, or clock, or phone in the rooms. If you needed something from the desk, you walked there. But you had to do it before something like 10 at night because Georgina at the front desk went home. This was the view from our deck, late one afternoon. 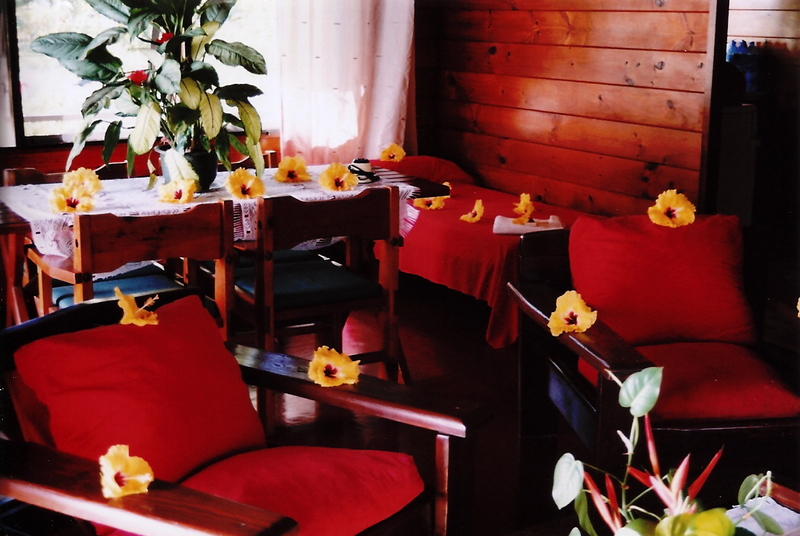 The little hotel restaurant, the Blue Pineapple, served fruit platters made with local bananas, pineapple, papaya and watermelon along with wonderful grilled tuna (what they call ‘lagoon fish’). But one evening we took a half mile walk along the road that encircles the island and found a little roadside place that served pizza so good that we went back every day. Yeah, I know, the idea of any pizza, let alone good pizza, in French Polynesia is a nutty idea. And let me further impress upon you that it was a shack, just a counter—no bigger than the french fry deals on the NJ boardwalk. But what a shack. The place was called Allo Pizza, the French-speaking kid who worked there was maybe 19, they had no real refrigeration and by all rights we should have died from ingesting some evil microscopic, Pacific Island, singsonging, flower-wearing organism, but their pizza was so incredible that it nearly made me weep. I should have taken a picture—forgive me—but I’ll tell you my favorite was Le Marseillaise, topped with fresh tuna, chopped capers, tomato sauce, garlic, herbes de Provence, Parmesan and anchovy. 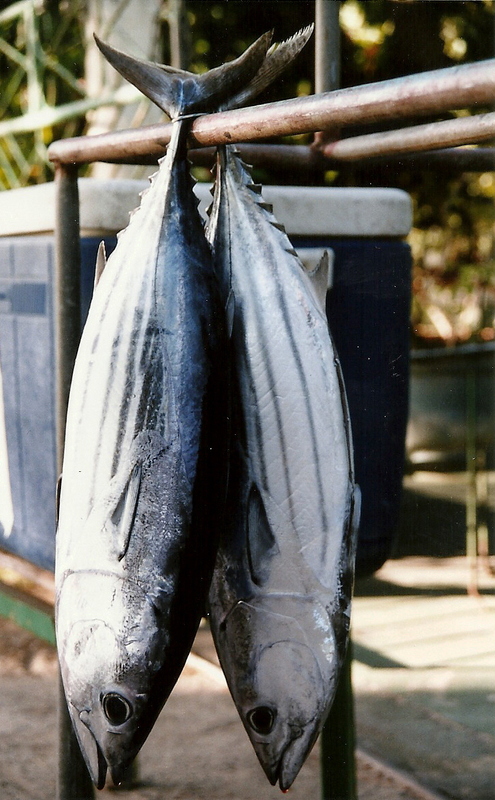 Incidentally, when I say fresh tuna, I don’t just mean it was local. I mean the Allo Pizza shack was across the narrow street from the beach, where fishermen would hang their catch from a makeshift rack and wait. Over the course of the day, people would drive by, choose one of their enormous fish, pay and drive off. The Allo kid did this too. The distance was about the same as you going out your front door and down the driveway. Fresh tuna. Fresh fresh. One night we tried Allo’s homemade chocolate mousse. Who would eat chocolate mousse served on a dusty road from a pizza shack on a sandy dot in the middle of the Pacific? Us. They don’t call it French Polynesia for nothing. It was perfect. 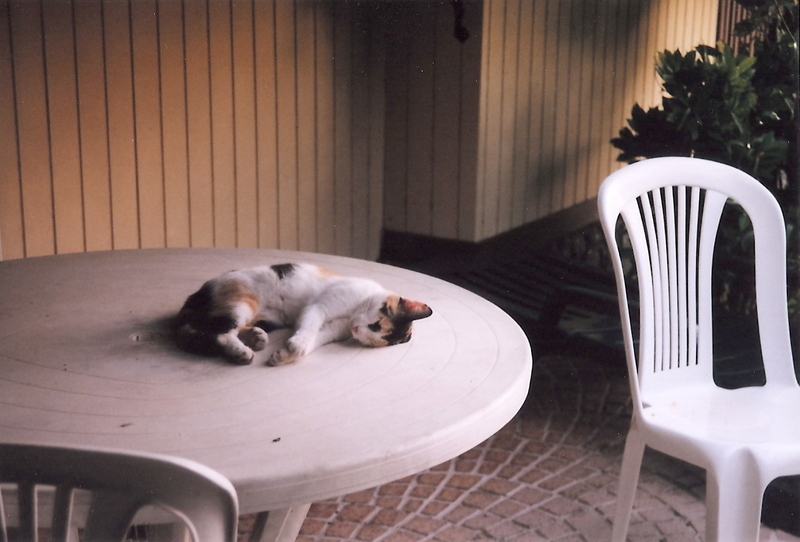 Cats have a rep for sleeping most of the day no matter where they live. But on these islands they go for the gold. The kitty below, who hung around our deck, is not dead. He is doing what he was born to do: beg for leftover bits of anchovy from my pizza, and summarily pass out for the rest of the day. 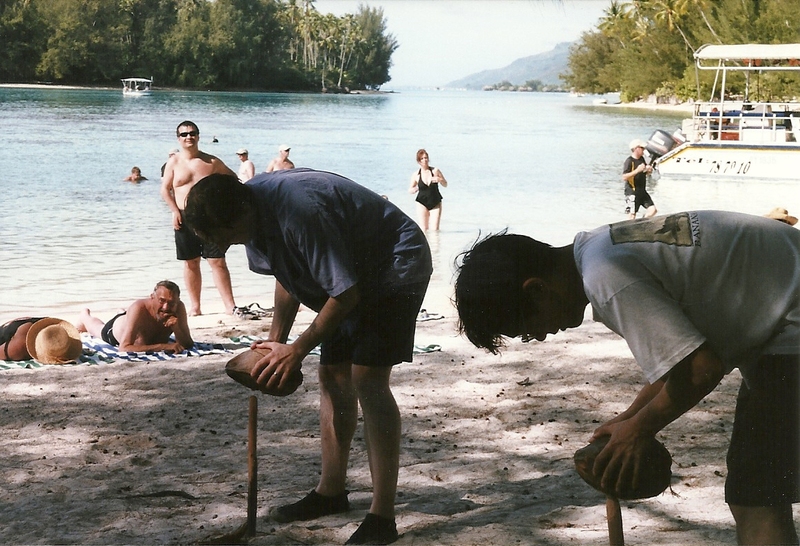 The itinerary read, ‘it includes visit of our 2 bays, fish, shark & ray feeding, snorkelling, barbecue on one of our nicest islet of Moorea…rice & pasta salad, fish, chicken, fruits, bread, rhum maitai, beer, juice, water and a coconut show with a lot of time for snorkelling and relaxing!’ So apparently no one dies. Look at all the food you get when you’re done hyperventilating! Actually, for some reason I was not worried at all. I was stoked, beyond excited. Saw the first dorsal fin and yelled ‘shark!’, cueing Bruno, grinning host, to open his cooler full of lagoon fish and start hacking off pieces to throw to the hungries. He threw it at a distance, while we were to jump, snorkels and cameras at the ready, maybe 10 feet away. 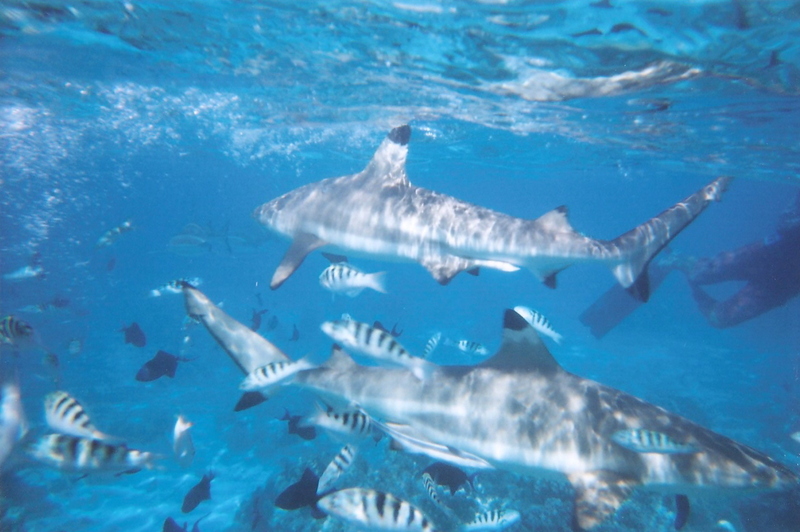 Zillions of kinds of colored fish, maybe a dozen sharks—it was like being inside an aquarium. I was never afraid. Don’t know why. Sometimes a shark would swim my way, face first, and come within maybe five feet of me. Then it was a little unnerving, but that’s all. They always turned around to eat the cut-up fish. By the way, that set of legs and fins in the photo belongs to a kid who actually swam among the frenzy, shooting the video which you could buy later. Mhm. He looks menacing, but they were very friendly—too friendly sometimes, like a yellow lab that’s just rolled in something gross and can’t wait to tell you all about it. You fed them bits of fish from your fist, but you had to be sure to tuck your thumb inside your fist or they’d try to slurp up your thumb. Enormous, some of them, several feet across. 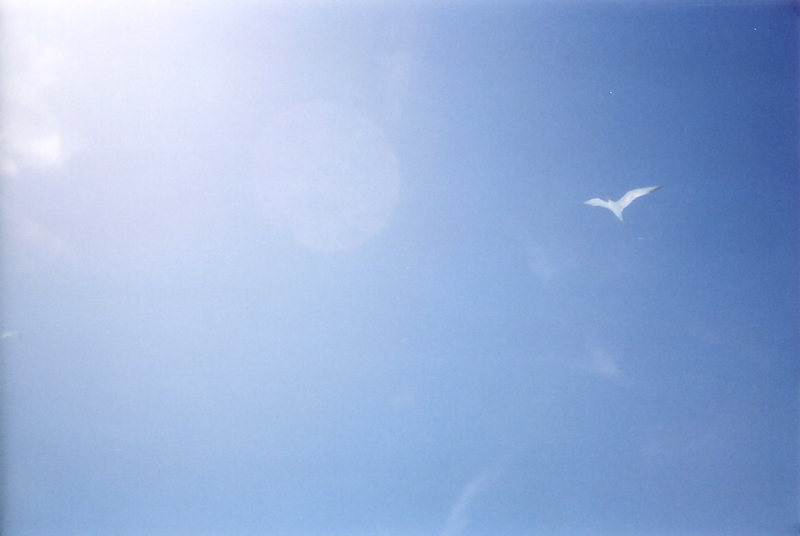 This is the view right over my head of the sky and a Pacific tern enjoying his day…. …and the view from the beautiful motu where we had our picnic. Bali Ha’i, shot from the boat on the way back…the real deal. …and eating. Les Antipodes (Restaurant Creperie) served savory and sweet crepes. ‘La Chicken’ was outstanding, chicken in a white wine/bechamel sauce, as was a crepe with hot pineapple and caramel. Polynesian + French influences coming together, and it was inspired. Carameline’s, a little bakery you’d miss if you sneezed, served banana and pineapple pastries with a buttery, buttery, tender crumb. We passed a lot of the enlongated mailbox-looking units below and asked a passerby what they were. Can you imagine?….They’re baguette boxes. Baguette eating is such a way of life on these islands now, a ritual picked up from the French newcomers, that many have it delivered daily the way we have mail, and the way we used to have milk, delivered. 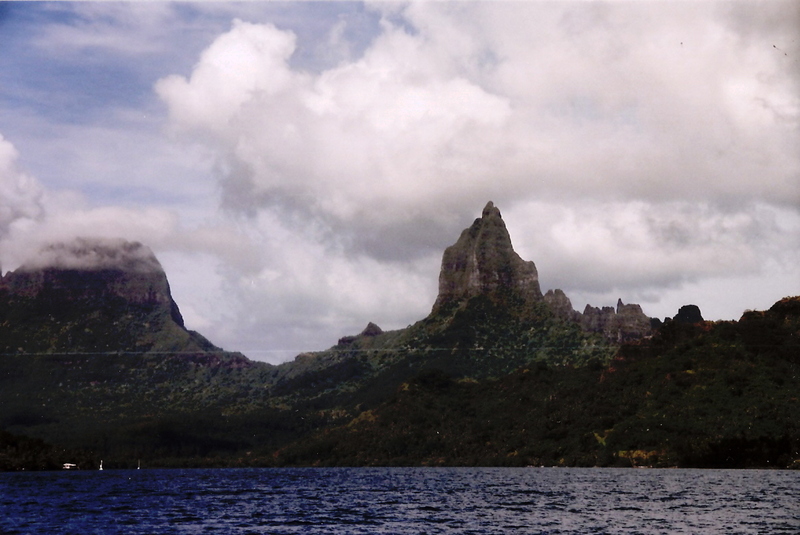 One afternoon we hiked in the jungle at the center of Mo’orea and saw moss-covered rocks, marae (places of ancient worship), sinewy tree trunks…and chickens. I’ve noticed wild chickens love the tropics. We trekked deeper and deeper into the heart of the jungle before turning around. Here I got nervous. This wasn’t a Monmouth County, NJ park near a major highway; it was about as remote a place as you can possibly get. And the deeper you went, the darker it got. 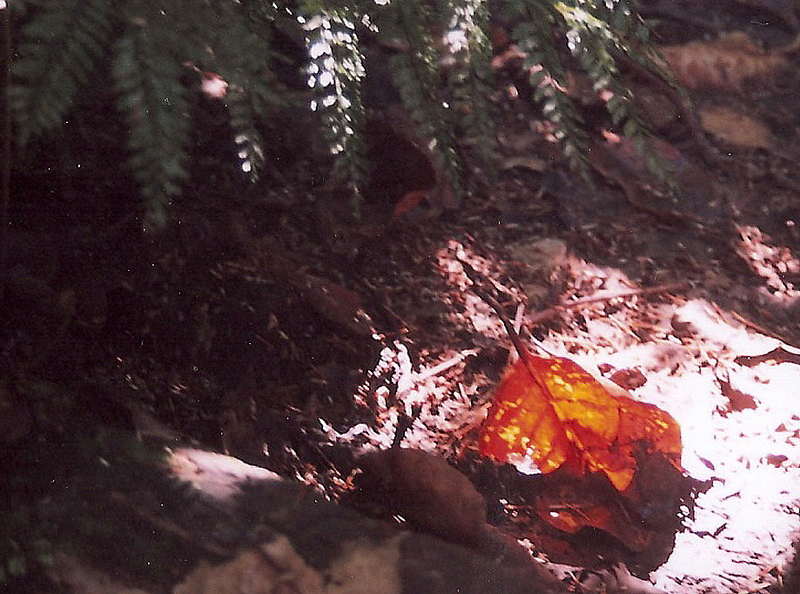 Before we left I took this shot of a leaf in a shaft of sunlight. On our way back, we stopped at the Lycée Agricole (Farming School) where the students there make the most delicious things from what they grow, using nothing artificial. Went delirious over their homemade pineapple/soursop (cherimoya) juice and very kicky citron sorbet. Another day we went back and had (below) three scoops of the most exquisite ice cream I have ever tasted: vanilla, gardenia (yes) and banana…all from local fruits and flowers. 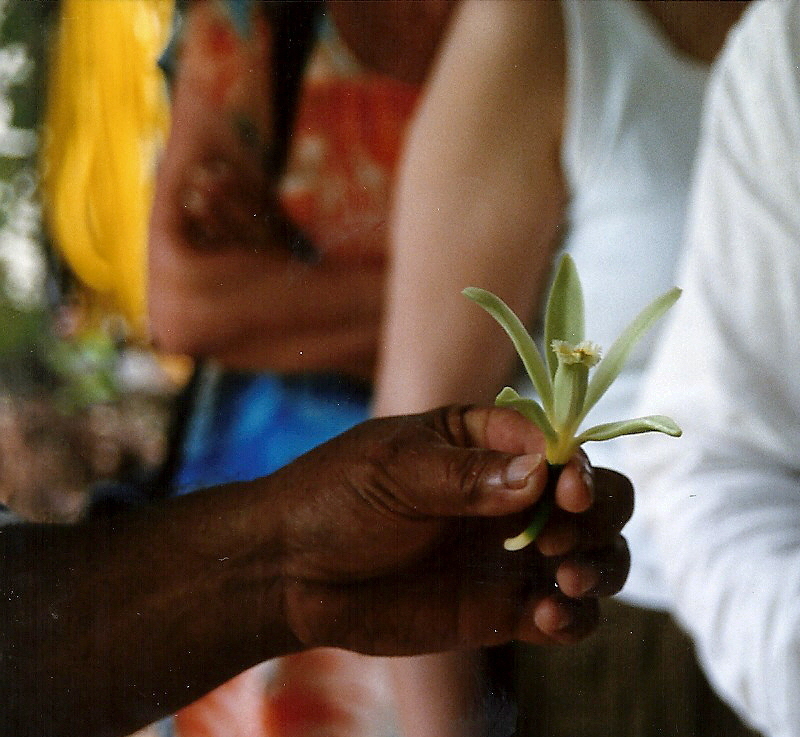 I’ll talk more about vanilla when I post about Raiatea and Taha’a, but in my journal I called the banana (there it is on top) ‘an avalanche of banana!’ And the gardenia is hard to describe—lovely, floral (of course), and very strange, but in a good way. What can I say. 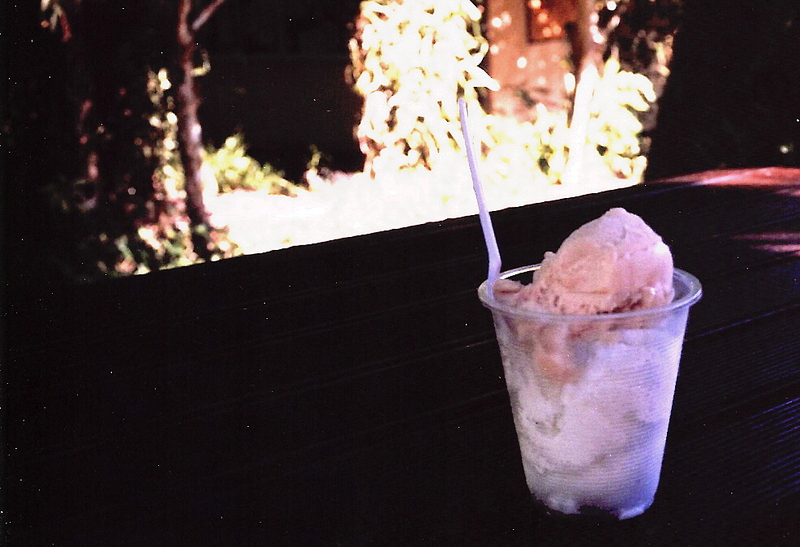 Gardenia ice cream. It’s raucous and silly but really fun, even though we lost every race—300 francs, about $4. 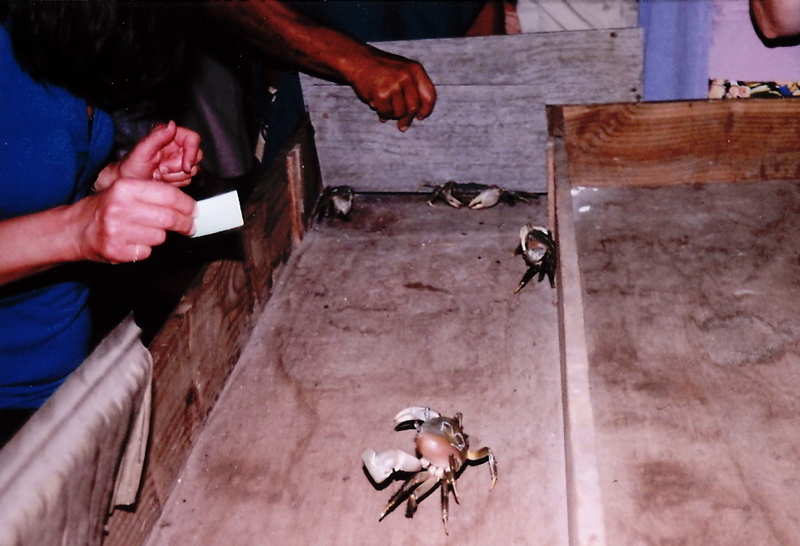 The crab bucket guy goes and finds crabs for the races, which is easy because on Mo’orea they are everywhere, the way squirrels are for us—on the beach, yes, but on the grass, along the sides of the roads, everywhere. He writes numbers on their backs in chalk and people place their bets. If we spent too much time hemming and hawing, he’d call out ‘hava-TEEEEEE! hava-TEEEEEE!’ (‘hurry up!’). I saw these hibiscus on a windy evening, and had to chase them to shoot them. They were really beautiful. Puddle jumper to Raiatea and Taha’a next week.